Photographs by the author, and scanned image added from the Wellcome Library, London, on this Creative Commons Licence by Jacqueline Banerjee, who has also supplied some extra details from the sources listed in the bibliography. You may use the images without prior permission for any scholarly or educational purpose as long as you (1) credit the photographer or source and (2) link your document to this URL or cite the Victorian Web in a print document. Click on all the images to enlarge them. Wood engraving by Gascoine and Maguire, 1866, after James Trubshawe, published in The Builder, 3 November 1866, p. 815. Courtesy of the Wellcome Library, London. Elphinstone College, by James Trubshawe, an architect who flourished between 1860-75, and was well known in India for his Gothic Revival buildings. It was completed by the engineer John Adams, and opened in 1871. Elphinstone College stands opposite the Victoria Memorial Gardens in Byculla, Mumbai. It is now a hospital, and a second Elphinstone College across the Jehangir Art Gallery was built a decade later. The college was planned and built in 1860s, one of the first great institutions of the Victorian age in Mumbai. The phasing out of the East India Company and the introduction of Victorian-age civic institutions and municipal governance in 1858 was a positive phase in the development of the city’s public administration and infrastructure. The decadent constraining factors like the old Bombay Fort of the EIC were removed and the city could now extend right into Byculla, and later Parel. This institution for scholarly excellence was constructed right opposite the Victoria Gardens, now called Rani Bagh after a change of names, where the Victoria and Albert Musueum (now Dr Bhaudaji Lad Museum) was. While the institution is of the Victorian age, it honours Lord Elphinstone (1779-1859), who was the Governor of Bombay from 1819 to 1827, and who significantly contributed to the development of the city in those earlier years. Left to right: (a) The bell-tower, with its elaborately carved gallery. (b) Close-up of the gallery. Click on images to enlarge them. The tower is high and dominates the skyline for miles even now. 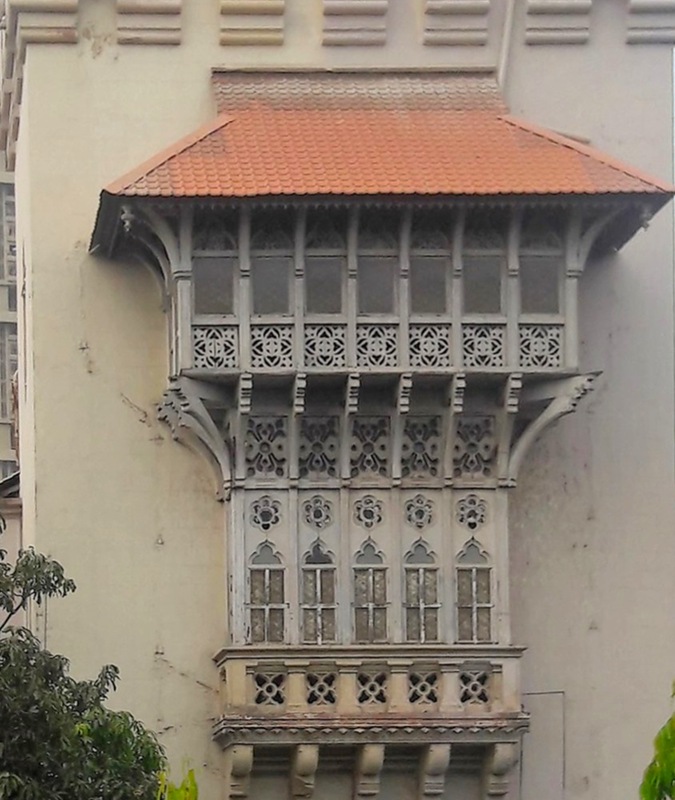 Its balconies of wood and stone were enlarged to make them distinctive external features, more reminiscent of "the ornately carved galleried fa&ccedi;ades of local Gujurati houses" than Venetian Gothic (Davies 167). The woodwork is very elaborate and delicately done. Corrugated iron was used for the roof, which was a new architectural introduction. The college had a multi-purpose basement, four lecture halls on the ground floor, two large rooms and a small one on the first floor, and a fifty-bed dormitory on the third floor. The cast iron railings came from England. The building now houses a railway hospital, which has built a large main building around the structure. According to Philip Davies, it has "suffered from unsympathetic infilling of the first-floor arcade and painting of the stonework" (167). This kind of development is inevitable in view of today’s needs for space and infrastructure. However it is good that the original building is still preserved and has not been razed, like the other Gothic-style heritage buildings at JJ (Sir Jamshedjee Jeejeebhoy) Hospital nearby. We hope it stays that way. Davies, Philip. Spledours of the Raj: British Architecture in India, 1660-1947:. London: Penguin, 1987. "Elphinstone College, Bombay." British Library Online. Web. 29 May 2016. London, Christopher W. Bombay Gothic. Mumbai: India Book House, 2002. Morris, Jan.Stones of Empire: The Buildings of the Raj. Oxford: Oxford University Press, 1983. Tindall, Gillian. City of Gold: The City of Bombay. New Delhi: Penguin, 1992.